A while back BMW introduced their M Performance lineup of cars. A pre-M, fun-to-drive, dynamically interesting mix of performance and functionality traits. In short, a very, very irresistible delicacy for the common enthusiasts. 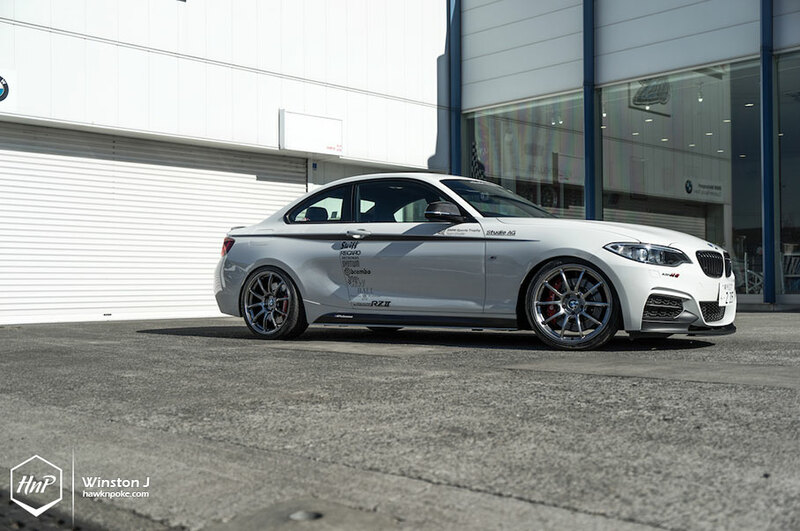 One of their greatest offerings at the time being is this M235i we are featuring today. Compact, very capable and stylishly exciting, this is the high points to BMW’s compact performance lineup. Fast without being overwhelming. Comfortable without being boring. 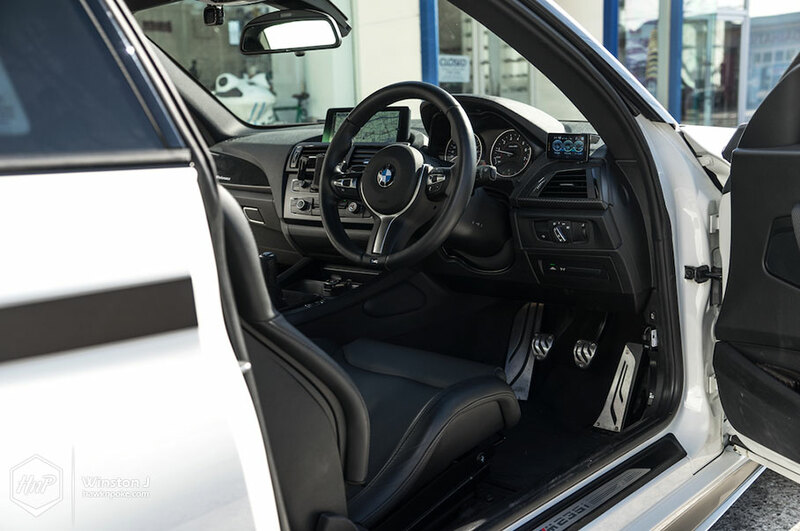 While full-blown M cars are known for their lavish price tags, class-leading performance and posh interiors, these M Performance cars are everything that the M isn’t. Their price points are much more accessible, yet their performance is still above the rest roaming our streets. 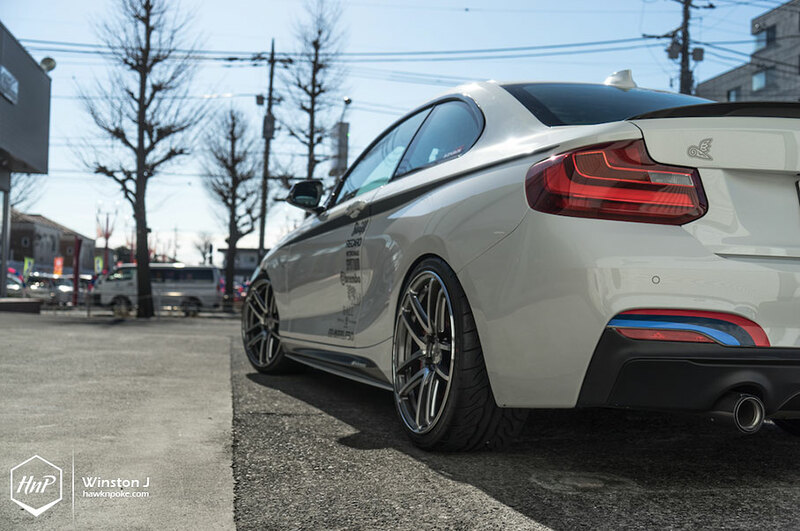 A beefed up version to the regular 2-series, a toned-down version to an M. The perfect sweet spot for enthusiasts wanting a properly quick daily method of transportation. 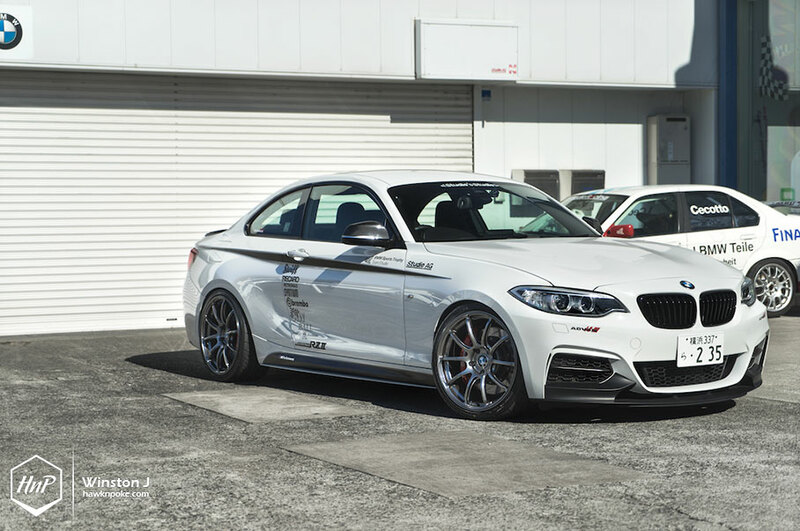 This M235i, in particular, feels like a rebirth to one of the older M3’s. 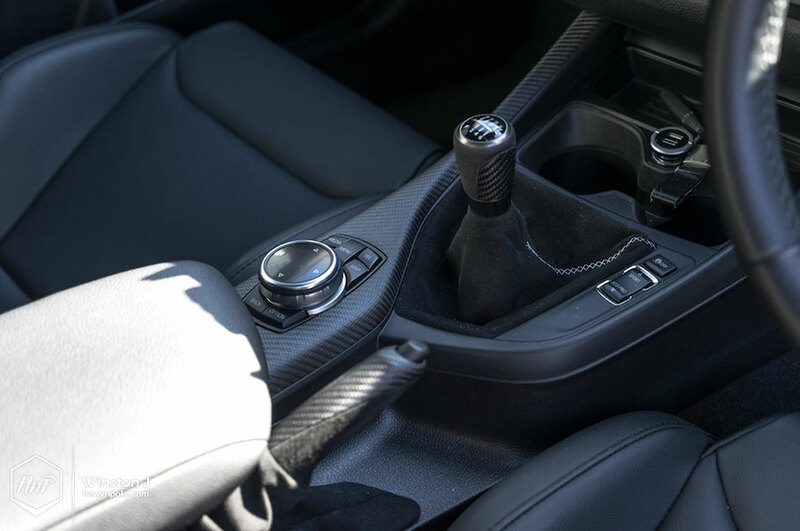 Even from its performance figures, the M235i matches that of an E46 M3, yet everything inside and outside has been reborn with modern parts, and much more comfortable too. A formula that has successfully excites each and every one of us. 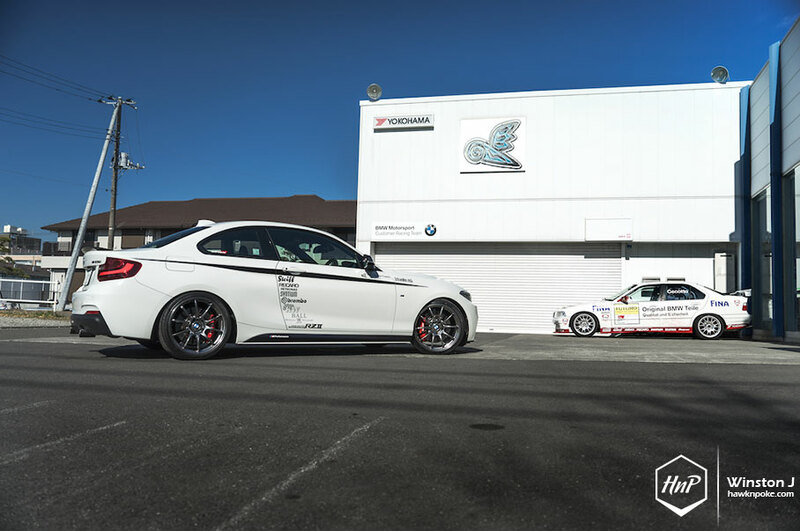 What I have today is a rather special M235i tuned by the famous Japanese Studie AG tuner shop. 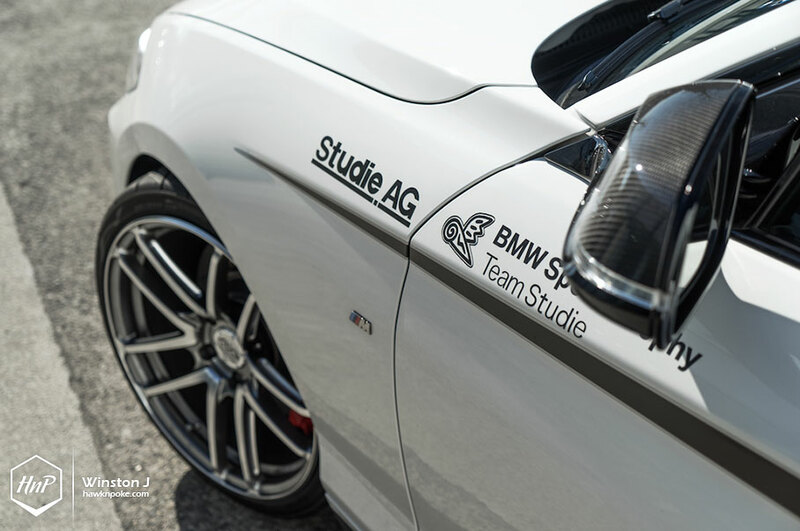 Always relying on the finest quality parts and cleanest exterior styles, Studie AG M235i has once again successfully showcased the shop’s expertise in BMW tuning. 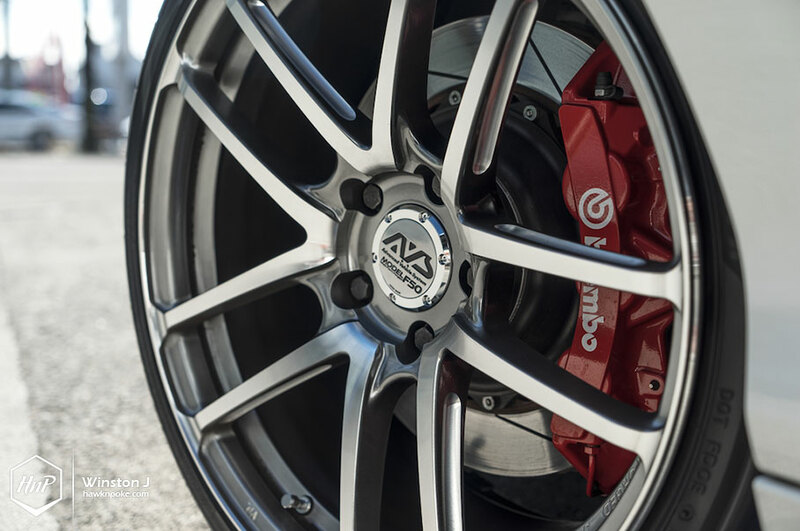 At a glance, one of the most notably good decision was this set of mismatched Advan wheels equipped. I’m pretty sure these were done because of its ‘democar’ status at the previous Tokyo Auto Salon; showcasing two slightly different sides of styles through the wheels setup. Yet whether it’d be the RZ or the AVS, I find both to be very alluring. 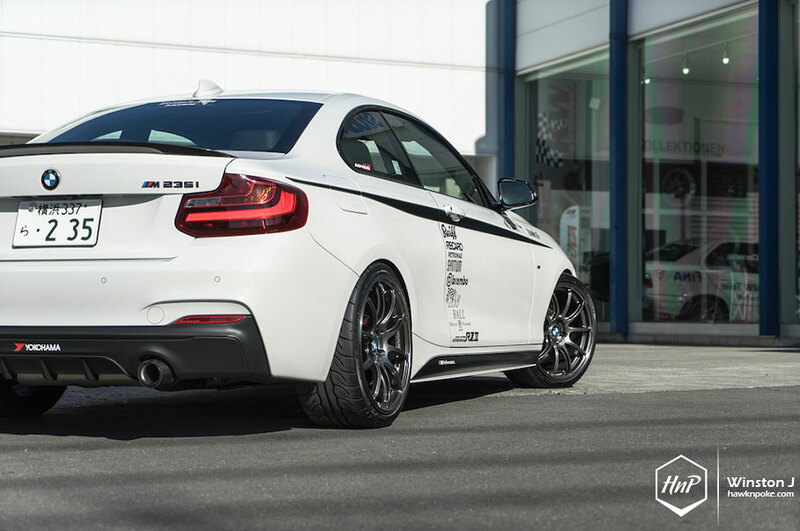 Underneath all of these gorgeous M Performance aero kits lies a deeper tuning that maximises the M235i’s true potential. 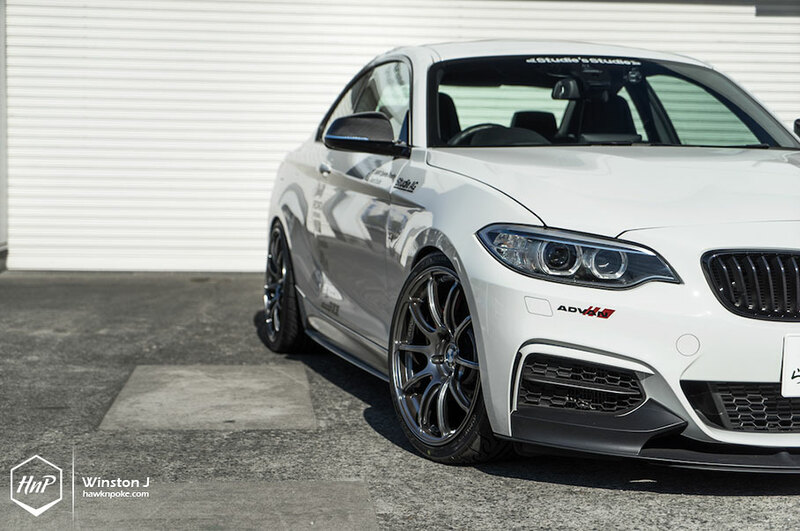 While BMW has engineered the M235i to be a fast daily driver, Studie AG has humbly re-engineered the coupe to unleash a more track-capable setup. 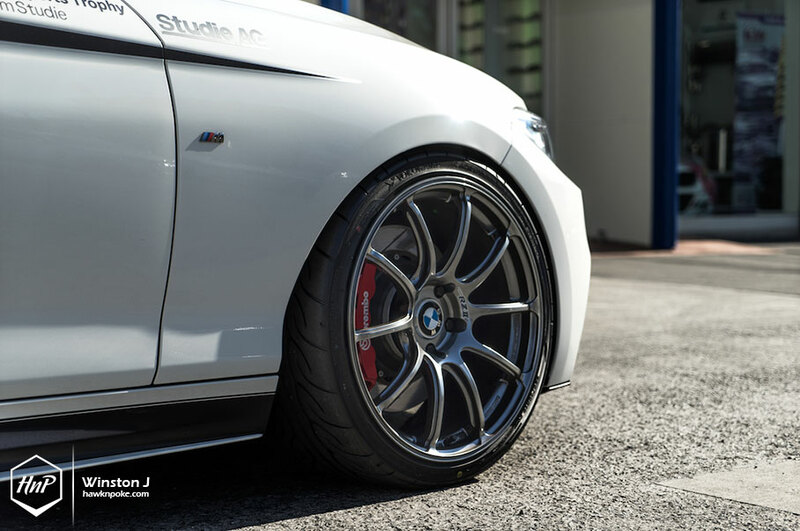 Most notably is the installation of track-ready KW Clubsport coilovers and Recaro seats beneath these shells. 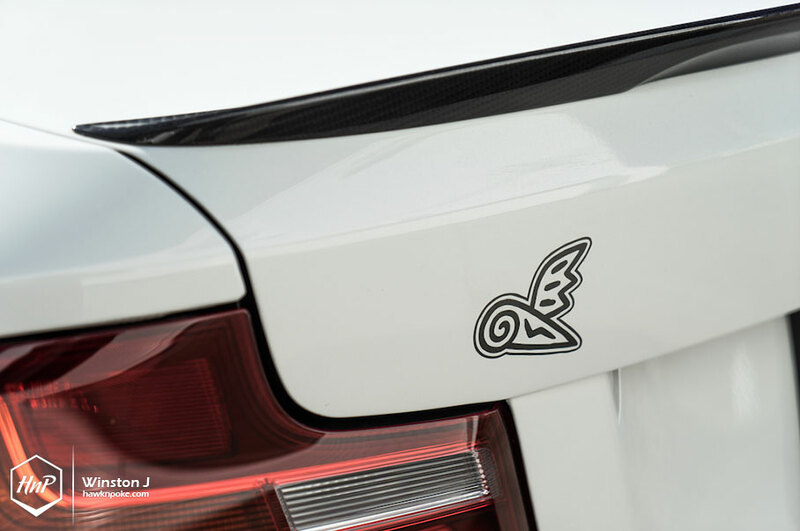 Studie AG has always implemented a track-minded plan for each and every democar it built. 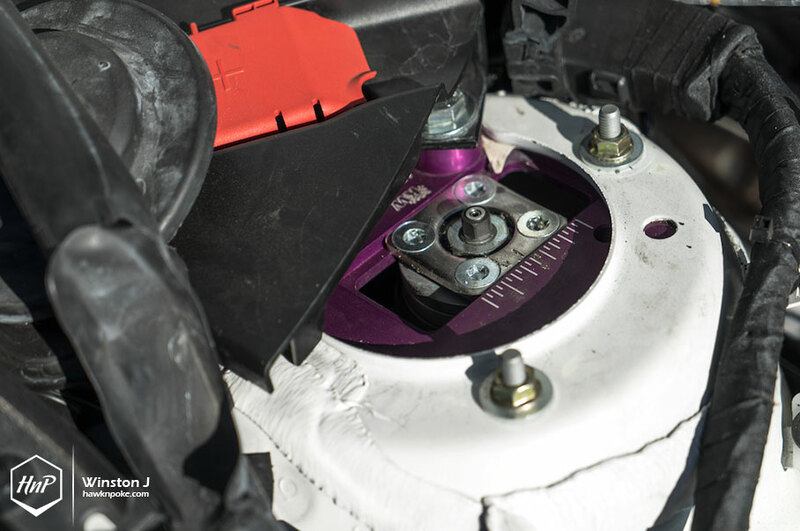 Therefore, supplementing the M235i’s performance are Studie Tuned Program for its ECU and these stunningly large Brembo GT brake kit. While one amplifies the inline-6’s turbocharge engine output, the other ensures an always-reliable braking distance on the track. 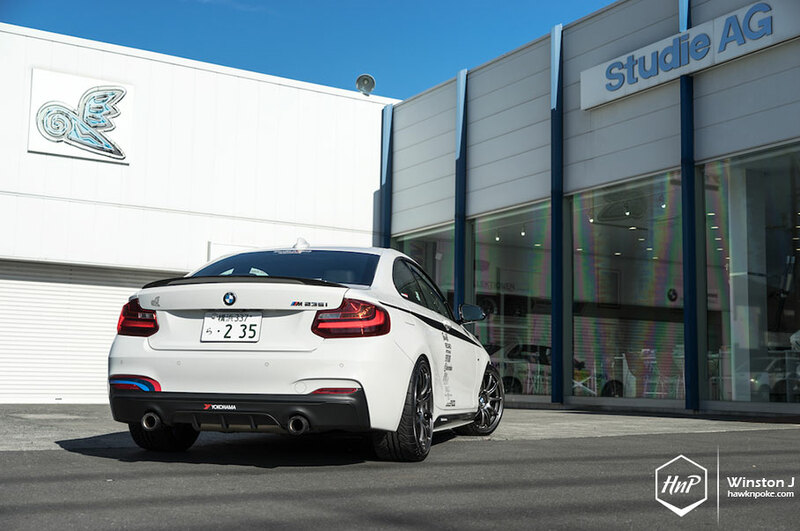 Our itinerary during this visit to Studie AG was to take a train to the shop’s nearest train station and later to be picked up by Akimitsu Ishizuka, the shop’s manager with this M235i. Undoubtedly, we were a bit worried at first whether the compact coupe could carry all the three of us altogether (me, Charles and Winston). 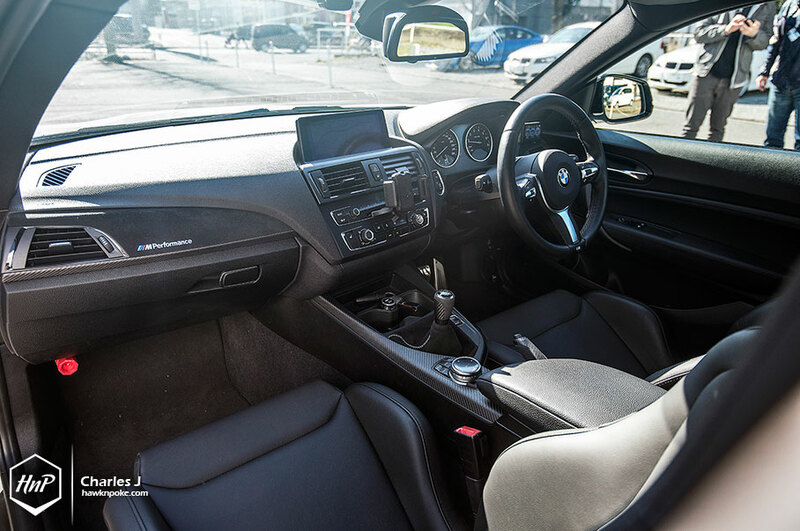 Yet upon meeting Aki and getting into the car, we were rather surprised by how well the M235i welcomed us with its comfortable interior. Despite being equipped with such lowered KW Clubsports, the ride quality was enjoyably firm and well-dampered. Even while carrying all the four of us through bumps and corners, the M235i acted very well-behaved and planted. I’m pretty sure these are all these are thanks to Studie’s expertise in tuning this highly capable coilover kit. Truly a perfect daily-drivable track setup done by Studie AG.